Read here about a mathematician who has contributed to the comprehension of tensegrity. George W. Hart is an interdisciplinary sculptor, mathematician, computer scientist, and educator. Hart is a pioneer in using computer technology and 3D printing in the design and fabrication of sculpture. Examples of his artwork can be seen at major universities, such as M.I.T., U.C. Berkeley, and Stony Brook University, and received a New York State Council for the Arts Individual Artist's Award. 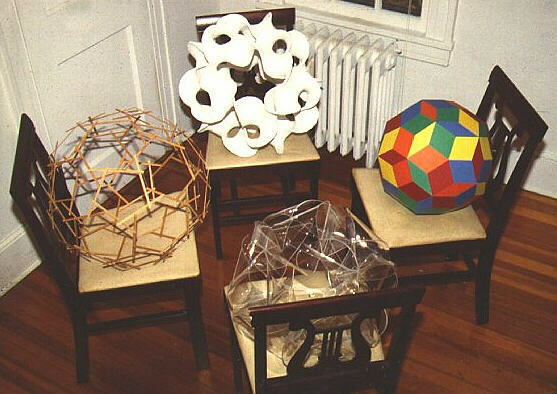 Hart's publications center on mathematical applications in sculpture and other fields. His extensive online Encyclopedia of Polyhedra provides a substantial reference, which is used by students and researchers around the world. His groundbreaking Multidimensional Analysis text (Springer Verlag, 1995) gives fresh insight into the structures of linear algebra. His Zome Geometry book (Key Curriculum Press, 2001) is the decisive Zometool reference. Hart co-founded North America's only Museum of Mathematics in New York City. Hart received a B.S. in Mathematics from MIT (1977), an M.A. in Linguistics from Indiana University (1979), and a Ph.D. in Electrical Engineering and Computer Science from MIT (1987). He has worked at the MIT Lincoln Laboratory and MIT Energy Laboratory as a computer scientist. He taught for eight years as a professor at Columbia University, and briefly at Hofstra University. After two years as a visiting scholar associated with the computational geometry group in the Department of Applied Mathematics and Statistics at Stony Brook, he was a research professor in the Department of Computer Science at Stony Brook (2001-2010). [[file:coffee stirrers and dacron thread near George Hart.gif|thumb|500px|none|coffee stirrers and dacron thread near George Hart" link=[http://www.georgehart.com/pavilion.html"
Below are links and texts from some of Hart's tensegrity publications. Hart created a tensegrity sphere from wooden coffee stirrers and dacron thread. [[file:coffee stirrers and Dacron by George Hart closeup.jpg|thumb|500px|none|coffee stirrers and dacron thread tensegrity sphere by Hart." link=[http://www.georgehart.com/pavilion.html"
[[file:coffee stirrers and Dacron by George Hart 1.jpg|thumb|500px|none|coffee stirrers and dacron thread tensegrity sphere by Hart." link=[http://www.georgehart.com/pavilion.html"
In "Symmetric Stick Puzzles", Hart describes wooden mechanical puzzles based on the idea of positioning identical sticks symmetrically in space on the 2-fold axes of a polyhedral symmetry group. Hart cites Ariel Hanaor, "Tensegrity: Theory and Application," in Gabriel, Beyond the Cube,1997. This page shows a relatively quick and easy method for making simple but fascinating tensegrity structures. The only materials needed are plastic soda straws, small paper clips, and rubber bands. The assembled tensegrity structures are polyhedral forms which vividly illustrate the separate forces of tension and compression. They are robust enough to squeeze and jiggle. Rubber bands provide tension and plastic soda straws provide compression. The instructions below are for making a tensegrity dodecahedron, but the underlying technique is suitable for a wide range of polyhedra. Being fast and inexpensive, this is a good classroom project. Based on my kids, I would suggest this as a project for middle school or high school students after they have seen and made paper models of the Platonic solids. The photo shows a complete tensegrity dodecahedron. 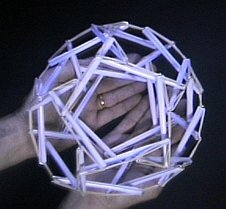 There is one strut (made from half a straw) for each of the 30 edges of a dodecahedron. The struts are rotated slightly compared to a dodecahedron edge, so rather than three struts meeting at a vertex, they make a small triangle. Cut one straw in half. For this model, I started with 8-inch straws, to make the 4-inch struts shown. Next add five outward-pointing struts, each of which connects to the 5-sided loop in two places. Make some other Platonic solids with the same method. The number of struts needed is just the number of edges in the polyhedron. For example, a tensegrity cube has twelve struts, making squares (cycles of four) rather than pentagons. You can slide the straws along the rubber bands to make them meet at a point other than the 1/3 and 2/3 points. If you slide them to meet as close to the endpoints as possible, the little triangles shrink to nothing and you get a dodecahedron. If you slide them to meet above the midpoints of the straws, you get a kind of icosidodecahedron in which the straws form six big pentagons, like equators, which weave in and out through each other. Note how the tensegrity structure is chiral, meaning that it has a left handedness or right handedness. You can construct its mirror image, or just look at its reflection in a mirror, which has the opposite handedness. Visualize how if you could turn yours inside out, it would switch handedness. In contrast, a plain dodecahedron is the same as its mirror image, and so is not chiral. Observe how no two struts in a tensegrity structure touch each other, yet the diameter of the overall the structure is roughly twice the length of a stick. There is nothing else like this: with an overall size larger than the size of its rigid components, yet the components are not rigidly tied to each other. The compression lies in disconnected pieces. Experiment with other shapes than just spheres. Although the soda straw method can be applied to other polyhedra, very complex tensegrity structures will be too flexible unless the rubber band is very tense. But a taut rubber band will cause the plastic straw to buckle, which is the ultimate limitation of this technique. For more complex polyhedra, stiffer struts --- wood or metal --- are essential. You will have noticed that rubber bands are rather stretchy, so your structure bounces and deforms easily. To make a more rigid structure, you can use a piece of string instead. This requires careful measurement so that each string is exactly the correct length. String solves another problem also: after about a year, a rubber-band tensegrity structure will self-destruct as the rubber becomes brittle with age. This page was last edited on 24 November 2018, at 13:58.